Police in Hyderabad, India have arrested two men for stalking tennis player Sania Mirza. 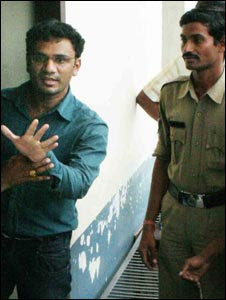 According to AP, police nabbed Ajay Singh Yadav today as he tried to barge into the tennis star’s house apparently to profess his love and seeking to marry Sania a day before she is to be engaged to Sohrab Mirza. Police took the engineering student into custody when he refused to leave. The arrest came a day after another engineering student, Mohammad Ashraf, was arrested when he tried to enter Sania’s house. The student threatened to commit suicide if Sania’s engagement ceremony was not cancelled. Mohammad Ashraf told Sania's father, Imran, that the tennis star could not marry anyone else as she "was born for him". He also demanded that her engagement with Sohrab, scheduled this Friday, to be cancelled. An alarmed Imran called the police who have taken him into custody. He has been produced in court and remanded for a fortnight. In his complaint to the police, Sania's dad says Ashraf claims to have been in love with the tennis star ever since he saw her playing a match in Bangalore two years ago. Sania's dad has also complained that the man had been sending text messages and making threatening calls to his daughter for some time. However, there's no explanation as to how the man got their contact numbers. Sania is never lack of controversies. Just last month, a state government found out that a man had secured a white ration card showing Sania Mirza as his wife. The ration card which is meant for people living below the poverty line carried a photo of the Sania!